Apr6April 6, 2013 • By gloriapoole1749 • This entry was posted in Uncategorized and tagged artist; gloriapoole; artist-gloriapoole; gloriapoole-paintings; original art by Gloria Poole, Gloria Poole, Gloria Poole; gloriapoole; artist-gloriapoole; gloriapoole-paintings; gloriapoole1749; Thoroughbred oil painting by Gloria Poole; ; Rodeo sketch ; Kentucky Bluegrass sketch. Bookmark the permalink. ← Better late than never??? FYI, world: Also, I am adding this comment as a reply to my own post today because I haven’t figured out yet how to edit content I put here. The comments you see and the photos of people attached to comments that show in the right side column are a puzzle to me as I have no idea who they are or how they got added to my blog. I have been anxious about logging into this because of that. I Gloria Poole am a white, single, Christian woman who happens to be a Registered Nurse and artist in all mediums. This sketch I drew/painted entitled “Kentucky Bluegrass” is also posted on other blogs of mine. I find the wordpress platform difficult because it allows upload of photos but doesn’t allow any text added except as a description. So this blog is owned by me exclusively & not willingly shared with anyone. No one else has the password. Or I should say I have never given anyone the passwords to any hosting acct of mine, any email of mine, any blog of mine, any computer or device of mine. Gloria Poole of & in Missouri. Also see http://gloriapoole.blogspot.com for more info. Update: this photo is of me that you see attached to this comment. I deleted the unknown man who was trying to claim my painting “thoroughbred” as his. 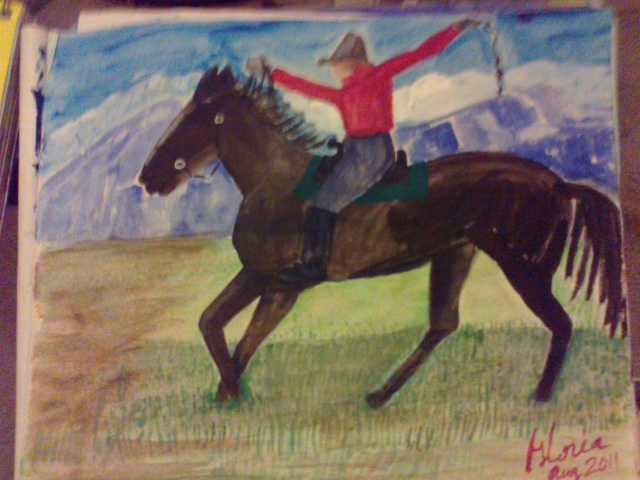 I have the actual painting in my apt that I painted and named “Thoroughbred” and that i posted on other blogs of mine. You can compare the photo of me that is on this comment with my photos on ‘about me’ page of http://gloriapoole.blogspot.com. I think that blog also has my photo of thoroughbred on it in archives, but if not other blogs of mine do have it.